What is Propaganda? And why do we care? Propaganda designers have been putting messages into television commercials, news programs, magazine ads, and other things we read and see for years. These messages have been carefully designed to influence our opinions, emotions, attitudes and behavior. Their purpose is to persuade us to believe in something or to do something. These messages have been designed to benefit someone, and that someone may not be you! It's not as easy as you might think to spot hidden messages. Propaganda does not rely on pictures or words. Sound, scent, color and design can carry many hidden messages. Propaganda designers know you are on your guard. To get around your guard, they don't put one message into a piece of propaganda - they put lots of messages into each piece! The more you know about propaganda techniques and how they work, the less likely it is that someone will sneak something by you! Is everything we see and hear propaganda? No, it is not. The word propaganda refers to any technique that attempts to influence the opinions, emotions, attitudes, or behavior of a group in order to benefit the sponsor. The techniques of propaganda are used every day, in the military, in the media, in advertising, in politics, and in all sorts of human relationships. 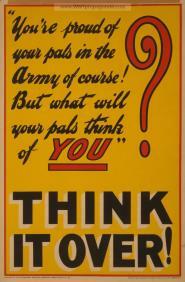 How did the use of propaganda push America towards war? Propaganda was used by both sides as they tried to show the other as monsters and evil. The Entente propaganda in America (Britain and her allies) was much more successful then the Allied propaganda (Germany and her allies) and pushed America to enter the war on the side of the Entente. Small Group Activity: Break into small groups. Using the link to propaganda posters provided above, pick one propaganda poster. Discuss how the poster makes you feel. Then, as a group, answer three question about the poster you selected: Who does this benefit? Why did they do that? According to whom? Be prepared to present your poster and answers to the class.